3/8" flow APC Series couplings feature a plastic thumb latch, fewer moving parts and a smooth contoured design to deliver ease-of-use and excellent flow in a compact size. 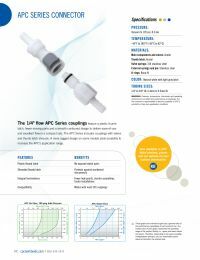 The patented APC Series has been expanded to include couplings with valves and thumb latch shrouds. A more rugged design on some models adds durability to increase the APC’s application range.